Mary (Blessed Virgin Mary or Our Lady, Greek: Μαρία, Spanish: Virgen María, French: Notre-Dame, Italian: Madonna) is the name of the mother of our Lord, Jesus of Nazareth. In the Gospel accounts, Jesus was born in Bethlehem of Judea to a young virgin, by the Holy Spirit. The gospel of Matthew describes the virgin birth of Jesus as fulfilling the prophecy of Isaiah 7:14. The gospel of Luke relates that the angel Gabriel visited Mary in order to announce to her that she had been chosen to bear the Son of God. Mary was present during the crucifixion of Jesus Christ along with other women who had followed Jesus from Galilee. While Jesus was hanging on the cross, "there stood by the cross of Jesus, his mother, and his mother's sister, Mary Cleophas, and Mary Magdalene. When Jesus therefore had seen his mother and the disciple standing whom he loved, he saith to his mother: Woman, behold thy son. After that, he saith to the disciple: Behold thy mother. And from that hour, the disciple took her to his own" (John 19:25-27). Mary's passage into Heaven is celebrated by Roman Catholics as The Feast of the Assumption of the Blessed Virgin Mary (March 25 and August 15). This Feast is a Public Holiday in many countries. 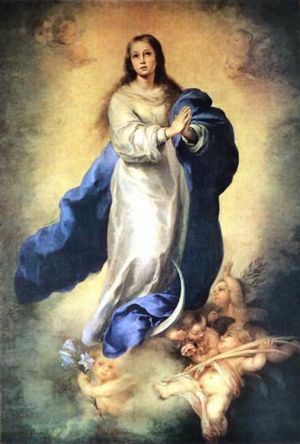 In 1950, Pope Pius XII formally declared to be dogma the belief in the corporeal assumption of Mary, which is known as the Assumption of Mary. The Orthodox Church expresses reverence toward the Blessed Virgin by the many feast days commemorating the various events in her life. In prayers the Virgin Mary is called Theotokos, which in Greek means the Mother of God, since the One Who was born from her was at the time of conception and always will be the true God. “Henceforth all generations will call me blessed.” Mary, Luke 1:48. While Protestants respect the life of Mary, some Protestants believe that the veneration of Mary is counter to what the Bible teaches. For some Anglican Christians Mary has an special position within God's purpose of salvation. (Catholics, Orthodox, and Anglicans, make a clear distinction between veneration (which is also due to the other saints) and adoration which is due to God alone). The prayer "Hail Mary" (Ave Maria) has its roots in Luke 1:42 where Elizabeth (who is Mary's cousin) salutes Mary and in Luke 1:28 where the Arch Angel Gabriel salutes Mary. Hail Mary, full of grace, the Lord is with thee, blessed art thou among women and blessed is the fruit of thy womb Jesus. Holy Mary, Mother of God, pray for us sinners now, and at the hour of our death. Amen. The Rosary combines vocal prayer and meditation centered around sequences of reciting the Lord's Prayer followed by ten recitations of the "Hail Mary" prayer and a single recitation of "Glory Be to the Father". While the Catholic and Orthodox churches believe that Mary remained a virgin after the birth of Jesus, most Protestants do not. Protestants base their views on the use of the word "until" and (in some translations) "firstborn" in Matthew 1:25, as well as references to brothers and sisters of Jesus, with James the Just among those listed, in Matthew 13:55, Mark 6:3, and Galatians 1:19.  . In the US, Lady of Prompt Succor, (New Orleans, United States, 1809). Wind-blown fire changes directions, sparing the convent; President of the United States Andrew Jackson credits the Lady with the victory in the famous Battle of New Orleans in 1815. The Blessed Virgin Mary Catholic Encyclopedia. Hail Mary Information on the Blessed Virgin Mary. The Mary Page About Mary. Virgin and Child, Emmanuel Tzanes of Crete, 1664. This page was last modified on 12 March 2010, at 12:50. This page has been accessed 63,145 times.